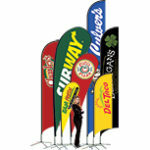 Market umbrellas, street-side marketing with blade flags, branded tents for your events and all types of banners. By listening to our customers and addressing their concerns, we engineered the best promotional products in today’s marketplace. Combining decades of imaging experience on the toughest industrial textiles with lightweight, durable hardware systems. We addressed issues regarding fade, functionality and value. Diverse print applications, weatherproofing, coatings and field testing are all part of our formula to deliver the best that money can buy. Call us and we’ll set you up with a brand image that your customers won’t soon forget. Premium aluminum frames with limitless print options on tent canopies. Print: Single-Reverse or 2 sides right-read. 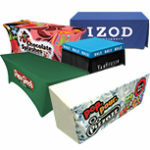 Polyester cloths in any style.